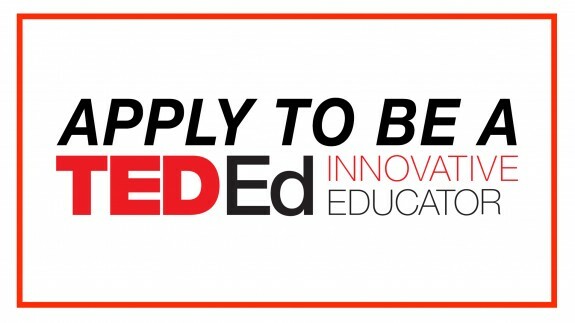 Apply to be a TED-Ed Innovative Educator! TED-Ed seeks creative and motivated teachers, principals, curriculum specialists, superintendents and educational leaders from all over the world to join our next cohort of TED-Ed Innovative Educators. Applications are due by August 19, 2016. Apply now, or read on for more details about the program! The TED-Ed Innovative Educator program is a year-long professional development program that connects outstanding educators in K-12, university and non-traditional educational environments around the globe. During the year-long professional development program, TED-Ed Innovative Educators participate in two months of digital training in how to help people make the most of TED’s free tools for teachers and students — including TED-Ed Animated Lessons, TED-Ed Clubs and the TED-Ed Platform — followed by 10 months of TED-Ed Innovation Project coaching and support within a dynamic learning community. Are you an educator seeking an inspiring community of learners and innovators? Do you find creative ways to solve problems in your classroom, school or district? Are you passionate about sharing TED-Ed tools with your community of students and teachers? Then you might be one of the next TED-Ed Innovative Educators. Apply here. The program launched in 2015 and now contains 58 educators from 17 countries. [Meet the first cohort and second cohort of TED-Ed Innovative Educators.] As TED’s on-the-ground education ambassadors and advocates, TED-Ed Innovative Educators lead their communities, and TED’s network of over 250,000 teachers, in developing and amplifying innovative ideas in education. Interested in becoming a TED-Ed Innovative Educator? Fill out the application here. Applications are due by August 19, 2016! This is an amazing group of cool teachers. Share and encourage folks to apply. Fabulous! Yes, I would encourage edu-leaders to join hands for a better and meaningful tomorrow for the generations to come. Remember, it’s a team work! I’m not an educator but I do health education. For instance, I’m working on a project to begin soon, titled ‘Fitness for the Life Within’ for expectant mothers in the Volta Region of Ghana. The project aims to promote good health in both mother and child and help reduce maternal mortality rate in Ghana and Africa at large. Another project ,-’Sitting is the New Smoking’ seeks to educate desk workers on poor office furniture ergonomics to reduce the wastage of government and private individuals’ resources on management of posture related musculoskeletal pain and other spinal conditions. Is there a TED program that suits my field that I can apply for? Is it an online or face-to-face program? I am the Founder and Promoter of ‘Train Up A CHild’ (TUAC), an organisation in Cameroon concerned with the Teaching, Education, Training and Welfare of children and youths in Cameroon. We promote knowledge and skill development at all levels. Our network of volunteers cover every field from classroom teaching to community workers, promoting quality effective education, sustainability and charitable endeavours. I will be very glad to join the TED team. Can someone help me get involved in the suitable TED capacity? I DEEPAK SHARMA BEING A PRINCIPAL OF MIDDLE SCHOOL REALLY WANT TO JOIN YOUR REAL TIME EDU PROGRAM. I am a secondary school teacher.I am part of educators in the digital literacy programme in Kenya.We are intergrating information , Communication and Technology.I will be pleased to learn more about TED-innovative Educators and join the cohort.Regards. TED is a wonderful informational and instructional tool. I´ve applied many ideas in my classrooms and in my reforestation and restoration projects, as well as in my relationships. After over 30 years of teaching, I now see people focusing more and more on technology, and humans are forgetting basic physical skills and the relationship with nature. Children are being fed more and more tech, which is an abstraction, and are getting further away from a healthy life of exercise, exploration, collective engagement, participation with Earth´s cycles and substances. I´m afraid that TED-Ed might fall for this same fallacious misdirection through its tech training. We need more people skills training, parenting skills training, listening to children, speaking to the heart, validation of who they are and working effectively with one another as educators. As an elearning website for secondary students in Nigeria where mobile telephony is expected to have a year-on-year growth of 16%, whose elearning market is expected to be the second largest in sub-Saharan Africa by 2016, and with students of secondary school age set to exceed 18% of national population; we have in the past four years been consistent in providing text-based educational content to these dear ones in all subjects of the Nigerian curriculum, and seen their confidence and appreciation grow. But to make the best of these growth, and reach ever more increasing numbers with education that’s truly transformational – such one that helps our students compete with the best around the world – we recognise the high role of interactive, instructional videos being part of our offerings, and engaging them on their turf – social media! And if the past four years is an augury of the attitude of young ones to technology – especially as related to their education; then the next four years and beyond will be truly exciting, rewarding, and well worth – definitely well worth – everything we will sacrifice. We most certainly can’t wait! This is a very good program. I will like to join. I would like to join the website as I’m an educationist did my first degree an taught in all sectors of education from lower basic,upper basic, senior school an college. I like teaching an I want to be associate with it all the time in my life because as I’m teaching, I’m also learning too from them. I really want to join this programme. I really want to apply now. I somehow missed this. I have also selected for Microsoft Innovative Educator Expert Program. Very sorry because I didn’t know about it earlier.will it be available next year? I have apply on 14th August but I haven’t received any email of confirmation. Hi! Awaiting for a reply. By when should we here from you? Wao! This is such a nice innovative. As a website based on educating nigerian students on history, culture, government and current affairs, we are very eager to take part in this programme. I am looking forward to apply for next project! There is a new opportunity to be part of this group?